Sometimes I write about how unique and fascinating it can be to work on a college campus, and this shot is a good example of what I mean by that. There I was, walking to work on a drizzly Wednesday morning when lo and behold I came across an airplane sitting in the lawn just north of Theta Pond. (Look closely in the background and you can see one of its fountains.) At first I was a bit confused, and then when I noticed a tent on one side and a hammock on the other side, I was even more befuddled. 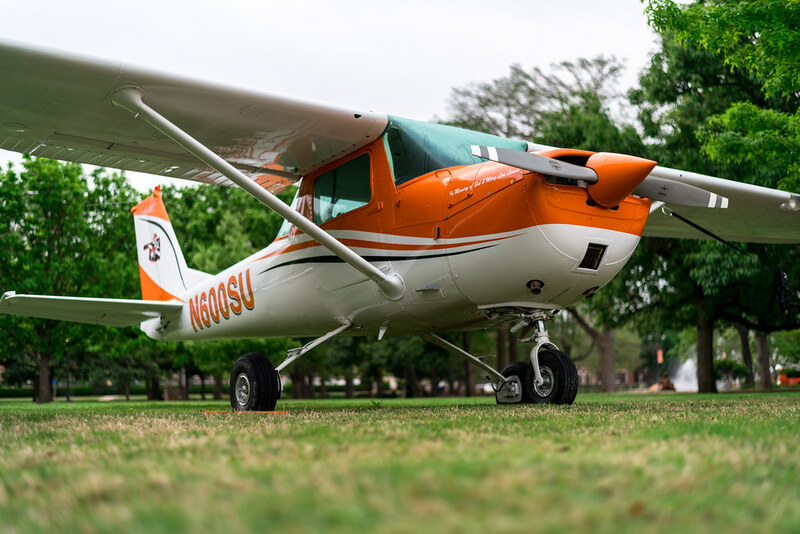 Then I remembered that about this time in 2016 the OSU aviation students, otherwise known as the Flying Aggies, had parked the same plane at the same spot in order to spread the word about who they are and what they do. It’s not a bad shot and in some ways I kind of prefer it to the one I actually posted for this week because the trees and tents serve to create a somewhat unique and compelling story. Ultimately I decided that there was just too much going on in the frame, and with the colors of the tents being so similar to the surrounding scenery anyway I thought it would be best to just focus on the airplane. Basically, the one taken from eye level looked more like a snapshot whereas the one I decided to actually use felt more like an actual composition. I don’t know if I’m just grasping at straws here, and I might be, but I really do feel like there’s a substantive difference between the two. I walked a bit closer to the plane, crouched down on the ground, and fired of a couple shots that I still wasn’t quite happy with. I was using f/1.8 to really bring the front of the plane in focus while getting a bit of foreground and background blur, which is difficult to do when your subject is so large and you’re standing several feet away, but something about the perspective just wasn’t working for me. Thankfully my D750 has a little flip-out screen which I rarely use, but when I need it oh boy does it ever come in handy. I literally set my camera on the sidewalk, angled it up, switched on Live View, popped the screen out, and voilà. I got the shot I was aiming for. The low angle and closer perspective helps isolate the plane and give it a sense of power and presence that the other shots lacked, and I’m happy with how the tail is perfectly visible but slightly blurry too. I like the perspective and the fact that you didn’t attempt to get the whole plane in the image. My tendency is to go after the whole instead of the part. I have to work on seeing what is really necessary to tell the story and not including everything–I may not need the whole tree, when a branch will accomplish the objective. Thanks for your explanation. Like all of your blogs, you get to the point and that helps me to think through my choices when I am photographing. I don’t know why you aren’t happy with the cover photo. Your last sentence conveys why you, as a photographer, know how to capture a more dynamic image. One of the first assignments in my class is to take photos of the same subject but from 5 different perspectives, Look up, Look down, Eye Level, Far away and Close. You really should teach a class. I do like the perspective of the cover photo. It is a good photo. And here is my opinion not that you asked for it. The tent, the plane, and the hammock is a story. I love good photos and different perspectives, but it is what it is, a plane. The other well I would have questions. I would wonder. I would want to know what is going on there. I guess it depends on what you, the photographer, want to convey. A good picture or a story. On this one, I prefer the story. Thank you for sharing. That gives me a lot to think about Janet, and I appreciate you saying it. The cover photo is, in my opinion, a better image from a composition standpoint but it doesn’t really have much going on besides just showing an airplane. 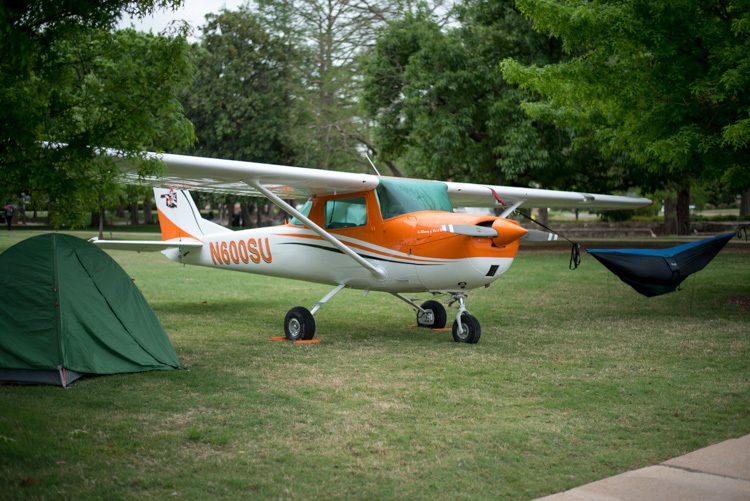 But seeing an airplane sitting on the lawn next to a tent and a hammock…now there’s a picture with an interesting backstory. The more I look at the second photo the more I like it, especially after reading your comment.